Compared to December a year earlier, contract signings dropped 9.8%, the 12th month in a row of year-over-year declines, and the worst year-over-year decline since the days of housing and mortgage crisis. The NAR’s report blamed the stock market swoon that had sapped consumer confidence, unaffordable home prices – that, after years of price gains had far outgrown wage gains – and mortgage rates. Nevertheless, the decline in mortgage rates wasn’t exactly huge. The average 30-year-fixed-rate conforming mortgage rate, according to the Mortgage Bankers Association, declined by 0.33 percentage points, from a peak of 5.17% in early November to 4.84% by the end of December, the same range they’d been in between April and August. The steep drop in pending home sales that has now continued for months in the vast and diverse West has left its mark on some of the hottest most over-priced markets, such as San Francisco and Silicon Valley. 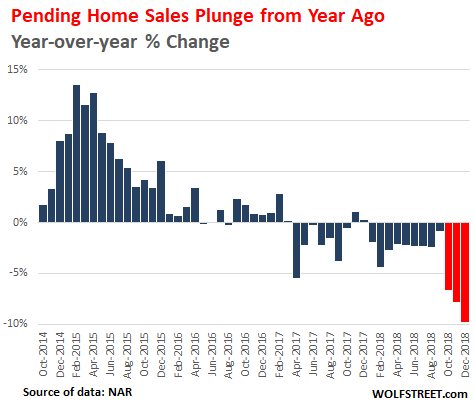 These markets that have been hit by sales declines saw a surge in inventory for sale, and starting last summer, declining prices. The pending home sales data for the West confirms that for now this trend continues on track. Flee markets tend to be full of other people’s junk, they don’t drop their prices for lack of sale but just to sell. My John L Scott Realtor friend here in West Bellevue – who specializes (for 25 years) in high end new home construction on the Eastside in the $1.5m to $3m range – told me in mid December that the new home absorption rate had dropped to below 15%. Truthfully though, she has had a terrific run with Chinese buyers since 2012-2013 onwards and is a long way from feeling the hurt from this obvious downturn. Talk about being in the right place at the right time ! I think she felt a little sorry for me in recent times because i have been telling her since as early as 2013 that I felt tht this west coast housing bull run would be short lived. Instead it was only beginning to pick up steam. Early or wrong ? Go figure. Well, keep in mind WA is one of eight states without an income tax. Very attractive to Californians who are getting taxed at the level of a Scandinavian country. Keep in mind we pay excessive property taxes, and have a very regressive sales tax. Salaries are also lower in WA than in CA, so the good with the bad. If you make over the median, WA is great, if not, you share more than your fair share of the tax burden. A 15%-20% correction would do the middle class some good in my area…(Central Valley) . And I think the new home developers that have projects going on can absorb that much without parking the equipment. Big question is, will the “Bay Area” transplants keep moving into these sleeper communities and not allow the correction to happen. Lots of moving parts in this cycle for sure. Very fragile imho. I can only hope for further drops to bring builders and sellers (of existing homes) to the realization, they need to lower prices and build for those who are starting out or recovering from the Great Recession. No everyone can afford a 300,000 to 400,000 dollar home. Hoping for a drop in Collin, Texas and surrounding area. So don’t laugh, but I’ve been trying to buy a house. It’s a rural area about 2 hours from NYC, beautiful but economically not doing so well and as a result it never recovered from the last bust. The first house I was in contract and there was a problem with the well. Owners didn’t have the cash to fix, so I decided to move on (and eat the inspection cost). Second house I offered $10K below ask as it needed some work. After lots of back and forth I learned the seller’s asking price was their current mortgage balance and they couldn’t afford to cut a check at closing. So I’m moving on again. I’ve also had two houses pulled by the owners who are “waiting for the market to improve.” I’m not in a hurry, but it is an interesting window into the market and household finances, if somewhat anecdotal. Not laughing Lou. We’ve been renting the last 3.5 years and finally bought last month. Renting gets old. Worn out houses… cheap landlords… inability to customize… difficulties for home-based businesses by local big government. We needed a home. So, we’re in debt again, but it’s ours (the bank’s). 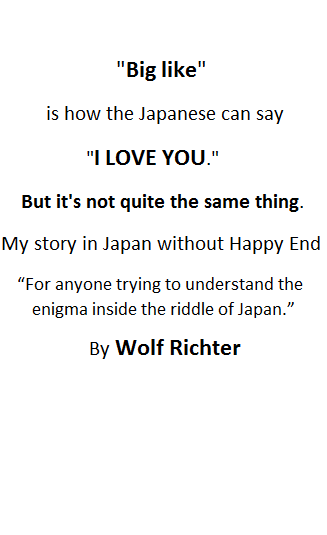 I’m happier. Like you, we had an inspection fail (lesson learned: get the inspection scheduled ASAP, preferably before escrow is due). Our second choice was for asking. The sellers lost about $60k. Not bad for south Florida. Hint: this means “owners know it will cost a fortune to fix but are playing dumb”. Maybe something for another article is the difference between “luxury apartments” and “single-family” and “multifamily” housing. Or sales to owner-occupants and sales to commercial property managers. My intuition is that the home sales that are tanking now are luxury accommodations that were built on the speculation of the Nouveau riche. Meanwhile, “housing stock transfers” with the intention to create a middle-class rental portfolio have stayed strong. To add to your thoughts: “Luxury” is defined in each market. For example, in San Francisco, the median house price is around $1.5 million. That’s median … so the middle. But in Tulsa, it would be ultimate luxury. Luxury is often defined as the top 10% or the top 20% of sold prices in a specific local market. So in terms of actual sales numbers, that segment is rather small and doesn’t hugely impact overall numbers of houses sold. This segment however does impact average prices a lot, and to a much smaller extent median prices (not discussed in the article). In a market like San Francisco, there only about 10-30 luxury sales a month. And this is a really volatile number. It can double from one month to the next and it usually peaks in the fall. It’s sometimes interesting to look at but it doesn’t impact the overall market that much. I understand there’s a bit of a semantic game being played in each market, but from the architecture and construction side, luxury usually implies certain amenities and characteristics that don’t cater to the working class and families. Characteristics like whether laundry is not on site, shared, in-unit, or a private service. Other things like playgrounds, gyms, pools, or in-unit wet bars tend to say something about the attitude the developer has towards it’s target market. It would still be interesting to parse out the difference between owner-occupied sales (ala “the American Dream”) and sales to the large companies like Blackstone, Invitation Homes, or other Real Estate Investment Trust money laundering schemes. To clarify my intuition, I believe this is a tale of two markets. This class of properties marketed towards the Nouveau riche are the ones starting to deflate, bringing the quantity gradually up and the average price way down. Meanwhile, the price of a “starter home” is staying well above the level that an average family can muster the credit for. If I’m reading between the lines in your latest report on New Homes prices, it actually alludes to point I’m trying to make. Existing homes aren’t experiencing the dip, but new homes that were constructed for a new market are. Maybe the specificity that I’m looking for doesn’t exist in normally reported data, but I have a hunch. So it’s not just QE, it’s QC = Quantitative Chinese (gorging on assets) that we experienced. That too is tapering or reversing. What’s next? These are good reasons to keep cash dry. A nephew was interested in buying a franchise in Las Vegas. The current owner is Australian and is nowhere to be seen. I told my nephew to wait and not buy and just to hang around in bankruptcy court. The great reset is just around the corner. Just be patient like the Fed. Iamafan, QC = Quantitative Chinese, that’s good! Thanks for the laugh. Here in San Diego we’re seeing inventory increase, foreclosure and pre-foreclosures up on Zillow, and high density builders scrambling to get their shacks on the market. Buyers evaporated in the past few months and all of this is reflected in prices dropping. Should be interesting this spring which is the usual boom time of the year for the market. More popcorn please. The Californian diaspora keeps inflating the price of higher end homes in the greater PDX area. Almost all of the home sales over the last few years in our neighborhood are to former CA residents. As prices now approach CA levels this should slow down. Hey, down here in Charleston, we get the Greater NYC diaspora who don’t want to put up with FL. Hope springs eternal with Mr. Yun. The last correction didn’t bring prices anywhere near historical affordability norms (3x annual HH earnings). The buy-to-rent buyers “saved” the housing market back then. Who’s going to step in now? He must know the months’ supply is breaking out of its normal cycle to the upside (https://fred.stlouisfed.org/series/MSACSR). The NAR was ever-hopeful throughout the last bust. It looks like they will use the same playbook this time. Good old Larry Yun. The man that insisted there was no such thing as a national housing bubble leading up to the great recession. I know you have to get all the data you can to be informed but this dolt has no credibility … just the Sarah Sanders of realtors. 2. They can NEVER say there is a true bubble/imminent crash- because they can’t be seen to be spooking the markets. Its good that Wolf’s site here is able to cut through all the rhetoric. This is nice, But I’m yet to see prices in the middle to low income <500K drop at all in California. Of course the houses in the 1M+ are dropping a 5-10%… but most people are not in that bracket. Houses in Central Valley and Sacramento for over 500K make no sense…Only a moron would buy that. they sell there $1 mil shack or move out of that $3,500 a month condo and commute to the Central Valley. They move from there to here and now here becomes there… (someone else’s quote btw)…. Been happening for quite some time. Powell caved, interest rates are down; stock market in (at least) a ‘mini-boom;’ house prices and sales will stabilize if not rise. Until the entire debt bubble collapses. Your guess is as good as mine. Powell rolled over like a dog, begging for belly rubs. It did not take Mr. Powell long to show his Wall Street roots. The chart has an interesting shape, and seems to support the narrative (I don’t mean that in the political sense we hear these days of “supporting the narrative”, only that this chart appears to illustrate what this text says). But what is the Y-axis? Thousands of contracts? It’s difficult to make overall sense of a chart that’s “just a picture” without the scale of what it is that we’re seeing. In any case, this is an enlightening peek into a new data source to help predict the future. Thanks for the story. 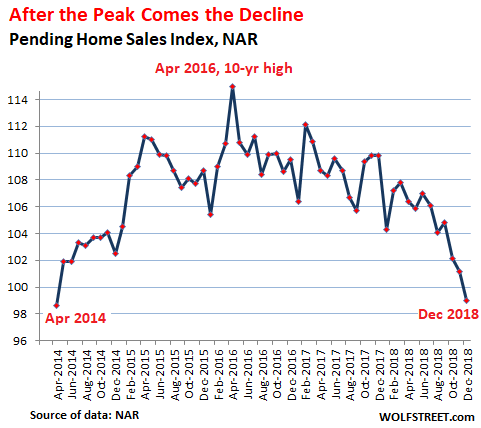 The Y-axis is the value of the Pending Home Sales Index. It’s an index based on signed contracts. The index was set at 100 for the year 2001 (first year of the data), and represented the average level of contract singings during 2001. So the current index value of 99 means a decline in contract signings from the 2000 average. The only new construction (SoCa) I see is high density. That should bring the median price down, but if those units aren’t selling that portends a far worse outcome. The sales of these units are more akin to new cars? I hope we see a 50 percent drop in vancouver it’s down 23 percent but its dropping daily we need a way bigger drop. Buddy suki dhaliwal is selling everything he said big drop coming in summer .I hope you all listen and take advice all listeners please dump bc real estate before it’s to late. And the NAR is only “frustrated” ? On what planet have they been living ? – A reliable source here in the US said that US tax payers have to brace themselves for a “stickershock” when they file their taxreturn next april. I also think I have to pay more taxes thix year. I did some preliminary rough calculations for 2019 and I “didn’t like” the outcome. (No, no details). Lawrence Yun is so utterly insufferable.